Blade length : 66.6cm or 26.2 inches. Sori :2.0cm or 0.78 inches. Width at the hamachi : 2.95cm or 1.16inches. Width at the Kissaki : 2.01cm or 0.79 inches. Kasane : 0.68cm or 0.26 inches. Shape :The blade has Ububa on the hmachi area which is very healthy blade with deep sori and long kissaki. Jigane : Koitame hada well grained with jinie attach beautihul texture. Hamon : Konie deki suguha with a lot of cyouji midare with ashi scatter and soft feeling habuchi. Special Feature : Yasunori, also pronounced Yasutoku in Japanese was one of a famous Yasukuni-tosho who was born in Hiroshima pref. He learned under his father Ujimasa and Yokoyama Sukeyoshi. Customarily Yasunori used the same name of his father Ujimasa before entering the Nihon-to tanren-kai. 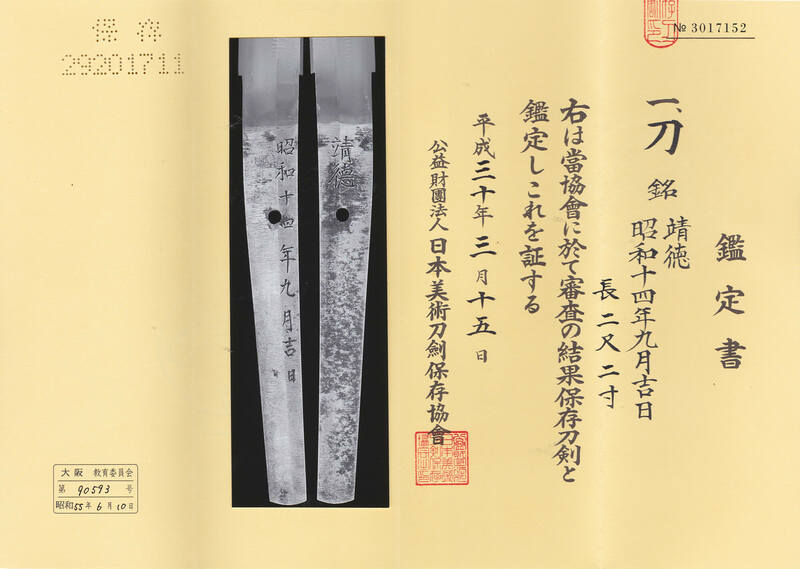 He entered Nihon-to Tanren-kai in 1933 and forged about1,250 swords including dedicating swords to shin-to shrines. Koshirae : Japanese navy high ranking officer's mounting. From Aoi Art : Yasukuni, the real name of him is Tokutaro Kajiyama, was a swordsmith who entered NIhonto Tnrenkai at Syowa 8Nen(1933) . He worked at Hiroshima prefecture and learned from his father Tomohira. First he was called Ujimasa and named Yasunori later on when entered Tokenkai. He made a lot of swords as one of the top members of Yasukuni sword makers. During his life, he made 1250 swords. His style was influenced by Kamakura period sword makers Nagamitsu and Kagemitsu. At syowa 15th he retired Nihonto Tanrenkai and from syowa 18th, his signature changed to Masamune. He passed away at Syowa 32. This sword must be possessed by a high ranking navy officer because the Saya was covered by shark skin. Back ground of age : A lot of Japanese swords were made during war time.